I’ve seen many beauty fads come and go over the years, each one promising to be the ‘next big thing’. Mousse foundation, brightly coloured mascara, quirky statement contact lenses (tiger eyes, anyone? ), and my personal fave, a foundation that you apply with a mini paint roller (as advertised by Eva Longoria for L’Oreal). Some beauty innovations have stood the test of time, while some barely lasted a season. The one beauty trend that has really stood out over the years was that of mineral make-up. I remember clearly the first time I heard of the innovation. I was ill, off work and full of Paracetamol. Part-bored, part delirious, I scrolled through the channels to find an American infomercial. For those of you who don’t know, infomercials are the most shameless form of advertising, an entire programme dedicated to a brand, aided by celebrity testimonials, real-life case studies and a delighted studio audience gasping on cue at the ‘must have’ item being paraded. The brand in question was Sheer Cover mineral make-up. It promised to be everything for every woman, and perfect for Asian skin. Naturally, the price was heavily reduced to draw viewers in. I was seconds from dialling and ordering a foundation that probably wouldn’t have suited me, before the Paracetamol wore off and sensibility settled in. I decided to have a think, take stock and shop around. In the end, I never bought Sheer Cover, or tried mineral foundation, as many friends and colleagues assured me that this was just another fad. However, I’ve recently had a rethink when it comes to mineral make-up, thanks to a relatively new brand, BellaPierre, which claims to be the ‘next generation of mineral make-up’ (I can’t vouch for this as I didn’t really get acquainted with the previous generation). 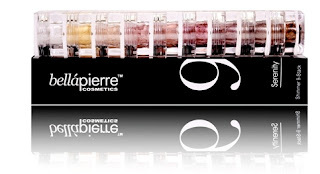 BellaPierre offers the full range of products, lipsticks, eyeliners, blushers, foundations, primers, the works. The brand also boasts unbelievable simplicity when it comes to its core ingredients, it contains 100% minerals, no talc, additives, or other chemicals, so it’s suitable for the most sensitive skin. So that’s the science-y bit. The real pull is that its colours complement Asian skin tones, a feat which many other brands fail to provide. I did my homework before trying BellaPierre and many of its reviews were from Asian women who had found their ideal match. When applied with a primer underneath, the mineral foundation leaves you with a matte look, which is great news for shiny girls like me. However a note of caution, only swirl on a small amount or you’ll risk being powdered out. It’s also a good idea to exfoliate your skin before use – if you have any dry patches, the mineral powder will gather there and hone in on them for all the world to see. BellaPierre also has great eyeshadows which offer vibrant colour without being garish. I found that particularly with Asian skin tones, eyeshadows can go either one of two ways, barely noticeable or plain scary. I used their eyeshadow stack in Serenity, and found that the colours are pretty, have staying power, don’t go into the creases of your eyelids and stand the test of time. However, at £35 for a pot of foundation, and £13 per eyeshadow, BellaPierre doesn’t come cheap. On the plus side, you only use the tiniest amount each time, much less than liquid foundation, or powder eyeshadow and with a three year use-by date, it’s practically economical on a cost per wear basis.